On Tuesday evening, June 17, 2014, The Skyscraper Museum presented the 2014 Making New York History Award to Stephen M. Ross, Chairman and Founder of Related Companies. Since forming Related in 1972, Steve Ross has been a leading urban developer and skyline builder, completing major projects in American cities from coast to coast. Related owns more than 45,000 units of housing, both luxury and affordable, and has developed more than 10 million square feet of commercial real estate, including the transformative Time Warner Center. Realizing a career-capping vision, Steve Ross has led Related's plans for the 28-acre Hudson Yards, the largest private real estate development in the United States. 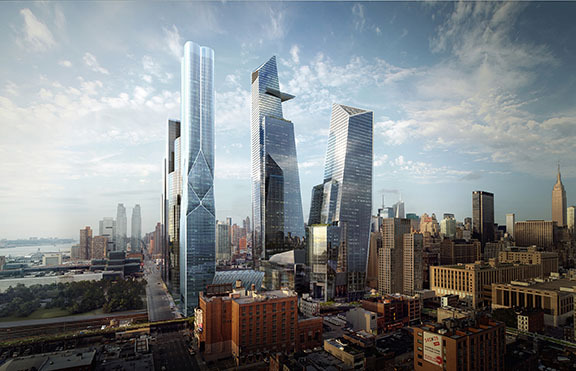 Hudson Yards Master Plan: Kohn Pedersen Fox Associates PC. Image: Rendering by MIR, Courtesy of Kohn Pedersen Fox Associates PC. For details on Patron Packages and tickets, CLICK HERE or contact our office at 212-945-6324 or programs[at]skyscraper[dot]org for details. WJE Engineers & Architects P.C. The Museum gratefully acknowledges the support for the event from: Acoustic Dimensions, Leonard Boxer, Cerami & Associates, Jan Cermak, Rafael Cestero, Clodagh, Code Consultants, Entek Engineering, Chris Esteban, Robert Fox, Harold Fredenburgh, Alexander Garvin, Jerry Gottesman, Philip Habib, Kevin Huntington, James Carpenter Design Associates, Marvin Traub Associates, Meredith Kane, Daniel Kaplan, Peter O. Lawson-Johnston, Don Lebowitz, Ronnie and Ken Lowenstein, Dennis Mehiel, Monadnock Construction Inc., Parsons Transportation Group, Philip Pitruzzello, Lynne Sagalyn, Silvercup Studios, Mark Stumer, and Joseph Welkek. Past recipients have included Kenneth T. Jackson & Robert A.M. Stern, John L. Tishman and Daniel R. Tishman, Douglas Durst, Larry Silverstein, The Port Authority of NY and NJ with Anthony R. Coscia and Christopher O. Ward, The Battery Park City Authority, The Empire State Building in honor of--in the tower's 79th year--the glorious restoration of its original Art Deco lobby and the beginning of a transformative "green" rejuvenation, 1 Chase Manhattan Plaza with Frank J. Bisignano and Skidmore, Owings & Merrill, Daniel L. Doctoroff, CEO & President of Bloomberg and former NYC Deputy Mayor for Economic Development and Rebuilding, and Brookfield Office Properties, on the 25th anniversary of The World Financial Center.